To compare between trimanual and unimanual vitrectomy in complicated proliferative diabetic retinopathy (PDR). A prospective, non-randomized, comparative study including patients with tractional retinal detachment (TRD), vitreous hemorrhage with TRD, and combined TRD with rhegmatogenous retinal detachment. The patients were allocated into two groups: the unimanual group with three-port vitrectomy and the trimanual group with added fourth sclerotomy, through which the endoillumination probe was guided by the assistant. The primary outcomes included the intraoperative feasibility, operative time, and complications. Eighty-two eyes were categorized into the two groups: 44 eyes in the unimanual group and 38 eyes in the trimanual group. Operative time was significantly shorter in the trimanual group (P < .005). The incidence of iatrogenic breaks and intraoperative bleeding was significantly higher in the unimanual group (P = .034 and P = .044, respectively). Primary anatomic success was achieved in 90.9% and 94.7% in unimanual and trimanual groups, respectively, without significant difference (P = .411). There was no significant difference in the postoperative complications. Trimanual vitrectomy was proven to be a safe and effective technique in managing complicated PDR. It results in anatomical outcomes comparable to standard unimanual vitrectomy with fewer intraoperative complications. Recently, published studies had proposed the “trimanual surgery” term, in which the assistant offers the control for the endoillumination probe allowing a free hand for the surgeon to perform a bimanual handling of the instruments. This approach was assumed to provide a precise stereoscopic view for more challenging cases.8 So far, comparative studies evaluating this approach with other vitrectomy surgeries are limited in the published literature. To provide comparative efficacy as well as safety data, we conducted a nonrandomized, prospective study to compare between the classic three-port unimanual pars plana vitrectomy (PPV) and the four-port trimanual PPV using 23-gauge in cases with complex PDR. A prospective nonrandomized, comparative, interventional study included patients with PDR recruited between November 2015 and March 2018 at Ophthalmic Center, Mansoura University, Egypt. This study was approved by the Ethics Committee, Faculty of Medicine, Mansoura University, and adhered to the Declaration of Helsinki. Written informed consent was obtained from all patients after the nature of the procedure and its possible consequences were clearly explained. Patients were included in the study if they were diagnosed with PDR requiring surgical intervention, such as tractional retinal detachment (TRD) involving or threatening the macula, vitreous hemorrhage (VH) with TRD, and combined TRD with rhegmatogenous retinal detachment (RRD). Exclusion criteria included TRD resulting from non-diabetic causes, patients with previous vitrectomy, and previous intravitreal injection within the previous 6 months. Eligible patients were allocated into two groups according to the surgical technique: the unimanual group and the tri-manual group. In order to have nearly equal representation of each preoperative diagnosis in each group, there was sequential assignment of the study patients among the two approaches until the total number of the participants was reached. The primary outcomes were the feasibility of the approach, vitrectomy time, and intraoperative complications. Secondary outcome measures involved postoperative anatomical and functional outcome for both approaches. Preoperative demographic data included age, gender, duration, and type of diabetes. All patients had undergone the standard preoperative ophthalmic assessment. Best-corrected visual acuity (BCVA) was measured using Snellen's chart (converted to logMAR for statistical analysis). Counting fingers vision and hand movements were given the values of 2.0 and 3.0 on logMAR charts, respectively. Intraocular pressure (IOP) was measured by Goldmann Applanation tonometer (Haag-Streit; Köniz, Switzerland). Postoperative hypotony was defined as IOP of 8 mm Hg or less and ocular hypertension was defined as IOP 25 mm Hg or greater. Detailed fundus examination was carried using non-contact lens biomicroscopy (Volk +90; Volk Optical, Mentor, OH) supplemented with macular imaging using spectral-domain optical coherence tomography (SD-OCT) (3D-OCT 2000; Topcon, Tokyo, Japan) and B-scan ultrasonography. Intraocular lens (IOL) power was calculated using IOL master. Preoperative injection of intravitreal bevacizumab (Avastin; Genentech, South San Francisco, CA) (IVB) (1.25 mg in 0.05 mL) was carried 3 days prior to surgery in cases with enhanced vascular element. Preoperative panretinal photocoagulation (PRP) was classified into none (eyes with no PRP); complete (eyes with complete regression of neovascularization of the disc (NVD) and neovascularization elsewhere (NVE) and incomplete (eyes with incomplete regression of NVD or NVE). Intraoperative parameters were recorded including operation time (starting from applying the lid speculum and ending at its removal), the methods used for hemostasis, and intraoperative complications. Primary anatomical success was defined as a complete retinal reattachment after the initial surgery. Functional success was defined as visual improvement of 0.3 logMAR or greater. Postoperative complications were recorded and properly managed. Postoperative VH was classified into “early” (when VH occurs within 4 weeks after the operation) and “delayed” (when VH occurs after 4 weeks from the surgery). All the surgeries were performed by one surgeon (MME). In the unimanual group, standard three-port pars plana transconjunctival sclerotomies using 23-gauge vitrectomy were carried out under general anesthesia. The inferotemporal trocar was used for the infusion cannula and the upper entries were used for the vitrectomy probe and the endoillumination probe guided by the surgeon. After core vitrectomy, repeated staining of the vitreous was done to avoid missing residual layer of cortical vitreous. Conformal delamination or foldback delamination was used in dealing with the membranes. Meticulous vitreous base shaving (360°) was carried out to adequately remove the peripheral vitreous. Hemostasis was maintained by either raising intraocular pressure or applying endodiathermy. In the trimanual group after core vitrectomy, a fourth scleral port was added in the inferonasal quadrant, through which the assistant control the endoillumination probe. Removal of the membranes was then carried out bimanually using curved scissors in one hand and forceps in the other hand to order to peel globally adherent membranes especially in cases with combined RD in which the mobile retina poses a challenge on peeling. In some cases; bimanual bleeding control was performed using a flute needle in one hand and the diathermy probe in the other for more precise cauterization of the bleeding points (See Supplementary Video below). In both groups, for cases with combined TRD and RRD, endolaser retinopexy was applied as a barrage around the breaks. Endolaser photocoagulation was done to complete PRP up to the ora serrata. Phacovitrectomy was performed in eyes with visually significant cataract interfering with the operative field visualization. Silicone oil was used as an internal tamponade in all the cases and was removed at the third month. Patients were scheduled for follow-up visits at the first day; first week; and the first, third, sixth, and ninth months postoperatively. Complete ophthalmic examination was carried at each visit, with scheduled OCT imaging before and after silicone oil removal. Data were analyzed with SPSS version 20 (SPSS, Chicago, IL). The normality of data were first tested using Shapiro-Wilk test. Normally distributed continuous variables (parametric data) were presented as mean ± standard deviation (SD). Non-normally distributed continuous variables (non-parametric data) were presented as median (minimum – maximum). 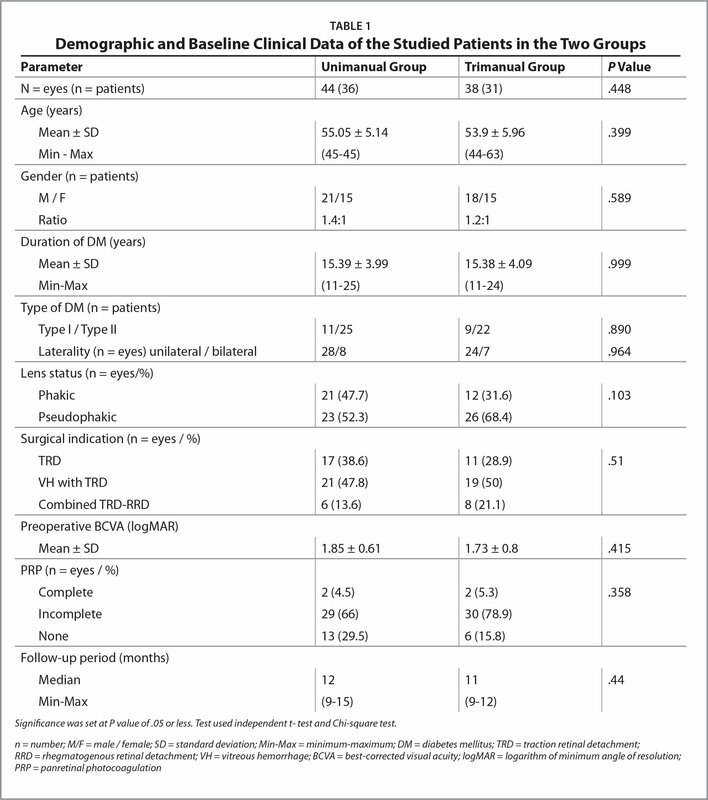 The clinical parameters within the same group were compared with paired t-test, whereas independent t-test was used in the comparison between the two groups. Chi-square test and Fisher's Exact test were used to compare between nominal parameters. In each test, P value of .05 or less was considered significant. A total of 82 eyes of 67 patients were included in the study distributed among the two groups. The unimanual group included 44 eyes (36 patients) and the trimanual group included 38 eyes (31 patients). Table 1 details the patients' demographic and baseline clinical findings among the two groups. There was no statistically significant difference in the preoperative parameters between the groups. Table 2 outlines the intraoperative parameters and complications among the two groups. The mean duration of the surgery in the trimanual group (73.42 min ± 1.01 min) was statistically significantly shorter than the unimanual group (104.3 min ± 0.9 min) (P < .005). The incidence of intraoperative iatrogenic retinal breaks was statistically higher in the unimanual group (13 eyes, 29.5%) than in the trimanual group (four eyes, 10.5%; P = .034). In the unimanual group, five of the six eyes with combined TRD and RRD encountered iatrogenic breaks compared to two out of the eight eyes in the trimanual group. Intraoperative bleeding resulting from membrane manipulations occurred in 23 (52.3%) eyes in the unimanual group and in 11 (28.9%) eyes in the trimanual group, with a statistically significant difference between the two groups (P = .044). The primary anatomic success was achieved in 90.9% of the eyes in the unimanual group and in 94.7% of the eyes in the trimanual group, with no statistical significant difference between the two groups (P = .411). Both groups achieved 100% final anatomic success at the end of the follow-up period after successful secondary PPV surgeries. Table 3 demonstrates the visual outcome of the studied patients. At the ninth month postoperatively; the mean logMAR BCVA showed statistically significant improvement from baseline values in both groups (P < .005) with no statistically significant difference between the two groups regarding the final BCVA (P = .092). Functional success was achieved in 29 (73.6%) eyes in trimanual group that was statistically higher than the unimanual group (24 eyes [54.5%]) (P = .04). Table 4 summarized the recorded postoperative complications of both groups. Early anterior chamber exudates were detected in eyes with combined phacovitrectomy in two eyes (4.5%) and three eyes (7.9%) in the unimanual and trimanual groups, respectively and were treated by topical steroids. Three eyes (6.8%) in the unimanual group and one eye (2.6%) in the trimanual group showed early transient postoperative ocular hypertension (range: 26 mm Hg to 30 mm Hg; P = .62) and were treated by topical anti-glaucomatous medications (beta-blockers). Progression of pre-existing ruboesis with development of neovascular glaucoma was recorded in one (2.3%) eye in unimanual group and two (5.3%) eyes in trimanual group; treated with transcleral diode laser cyclophotocoagulation (P = .699). Delayed postoperative VH occurred after silicone removal in five eyes (11.4%) in the unimanual group and in three eyes (7.9%) in the trimanual group, with no statistically significant difference between the two groups (P = .719). Intravitreal anti-VEGF injection was used in managing delayed VH in two eyes (4.5%) in the unimanual group and two eyes (5.3%) in the trimanual group. Additional endolaser application with gas injection was required in three eyes (6.8%) in the unimanual group with VH. Transient hypotony was recorded within 1 day after silicon oil removal in four eyes in each group (P = 1). Hypotony resolved spontaneously within 1 week without consequences. Thickened epiretinal membranes (ERM) affecting vision that required peeling was detected on OCT images in two eyes (4.5%) in the unimanual group and one eye (2.6%) in the trimanual group with no significant difference (P = 1.0). Recurrent retinal detachment developed in four eyes (9%) and two eyes (5.3%) in the unimanual and trimanual groups, respectively, with no statistically significant difference between the two groups (P = .681). The recurrent cases were treated with repeated PPV and silicon oil injection and remained attached until the end of the follow-up period. Total number of reoperations was nine (20.5%) in the unimanual group (three gas injection for VH, two peeling of ERM, and four PPV for recurrent RD) and three (7.9%) in the trimanual group (one peeling of ERM and two PPV for recurrent RD), with no statistically significant difference (P = .109). None of the cases developed visually devastating complications such as endophthalmitis. The current study was conducted to assess the potential benefits expected from the four-port trimanual vitrectomy in cases with advanced PDR compared to the standard three-port unimanual approach, as well as evaluating the revealed limitations in dealing with these challenging cases on applying both approaches. Intraoperative monitoring of the trimanual approach confirmed enhanced visualization of the dissection planes between the retina and the membranes owing to the dynamic illumination. The trimanual approach provided effective and rapid excision of the membranes in the posterior pole as well as the equator, raising the surgeon's easiness on dealing with the fibrovascular proliferations. In our series, the vitrectomy time was significantly shorter with the trimanual technique (P < .005). These results were consistent with the results of the retrospective study by Wang et al.12 comparing the two approaches. Kellner et al.13 found that the pure vitrectomy time needed with small-gauge vitrectomy (SGV) was longer than that with firm 20-gauge PPV, even in straightforward cases. More time would be needed in cases with more complicated status. Bimanual SGV changed this concept. The time for membrane dealing was tremendously shortened even in complex cases, with subsequent reduction in the likelihood of phototoxicity as well as postoperative inflammation.14 The reduced time for membrane removal in bimanual approach could be attributed to the decreased probability of switching between the instruments; the freed hand of the surgeon permits grasping the forceps to seize the membranes while performing dissection using a cutter or scissors with the other hand.15 Moreover, the superadded finer visualization obtained by the guided tracking of the illumination probe aided in the precise dissection of the adherent membranes. Lolah and Sharaawy16 reported higher incidence of iatrogenic breaks in the unimanual PPV compared to the bimanual PPV; however, the difference was not statistically significant (P = .136). Combined TRD/RRD usually represents one of the most complex surgically challenging scenarios. Complexity emerges from the pre-existing retinal ischemia, with subsequent atrophy ensuing iatrogenic breaks occurrence.19 In our series, the utilization of the trimanual approach facilitated the steps of removal of the membranes over the mobile detached retina, sealing the existing retinal breaks, and paving the path for re-attaching the retina. All these tasks were accomplished together with reducing the incidence of the iatrogenic breaks. Oshima et al.20 recommended the use of bimanual technique in cases with combined TRD/RRD. They suggested that the use of a blunt microforceps in one hand and the probe in the other hand during membrane separation and dissection might be safer, with resultant lower incidence of iatrogenic retinal breaks. Scrutinizing our postoperative results showed that the primary anatomical success was higher in the trimanual group (94.7%) than the unimanual group (90.9%); though the difference was not statistically significant (P = .411). Final anatomic success was attained in 100% of the eyes in both groups. Utilizing bimanual approach with chandelier illumination, Park et al.21 reported lower initial and final anatomic success rates (79.3% and 94.6%, respectively). They contributed their lower rates to the preoperative complicated nature of the included cases. With regard to the visual outcome, the postoperative BCVA in our series improved significantly in both groups (P < .005). Though there was no difference in the mean final BCVA (P = .092), the number of eyes attaining functional success was significantly higher in the trimanual group (76.3%) than the unimanual group (54.5%) (P = .04). This could be related to the number of cases developing recurrent RD and thickened ERM in the unimanual group. Several studies had evaluated the outcome of SGV in complicated diabetic cases as Shah et al.22 and Altan et al.23 utilizing 25-gauge and Oliveira et al.24 using 23-gauge vitrectomy. The functional success in these studies ranged from 61.5% to 85%. In our series, early and late postoperative complications were comparable in the two groups, with no statistically significant difference. None of the cases experienced early VH. Vitreous hemorrhage was encountered only following silicone oil removal in agreement with the suggested benefits gained by silicon oil tamponade. Shen and Yang25 evaluated the extended use of silicone oil in eyes with complex diabetic retinal detachment. They reported that recurrent vitreous hemorrhage in silicone filled eyes was more likely to be insignificant and not interfering with the visual axis. Lei Shi and Yi-Fei26 studied the correlation between re-bleeding and different internal tamponading agents as air, gas, and silicon oil. They hypothesized that removal of silicone oil eliminates the tamponade effect exerted on the retinal blood vessels thus predisposing to VH. Lower incidence of delayed VH in trimanual group (7.9%) in our series compared to unimanual vitrectomy reported in other studies15,27 may be attributed to the meticulous removal of the fibrovascular membranes and comprehensive vitrectomy that had been facilitated by the bimanual approach. Avulsion of remnant fibrovascular tissue on residual vitreal cortex had been suggested as frequent causes for delayed VH.28 Utilizing 25-gauge unimanual vitrectomy, Lee and Yu29 encountered recurrent VH at higher rate (11.8%). They noticed that postoperative hypotony increases the incidence by eleven-fold while the incidence of VH in tamponading eyes increased by only three-fold. The trimanual approach in the current study has proven to fulfill the expected benefits of the bimanual technique without the need of extra sophisticated instruments. The dynamic position of the probe overcome the restrictions arose from the static nature of the chandelier illumination. This was achieved by the help of the assistant without special prerequisites. One of the raised limitations in the trimanual approach was the need of an extra sclerotomy. However, this did not result in any related complications. Another aspect was the mandatory proper coordination between the surgeon and the assistant which serves in the proper alignment of the illumination throughout the operation yielding it a streamlined smooth process. The trimanual approach, though beneficial, will not be essential for all cases of PDR and could be kept for more complex cases with extremely adherent fibrovascular membranes as well as cases with combined RD. Trimanual vitrectomy with assistant guided endoillumination probe was proven to be a safe, feasible, and effective technique in managing of the complex cases with PDR without additional financial burdens. It results in superior functional outcome than the standard unimanual vitrectomy with less frequent intraoperative complications. Muramatsu M, Yokoi M, Muramatsu A, et al. Different outcome among eyes with proliferative diabetic retinopathy indicated for vitrectomy. Nippon Ganka Gakkai Zasshi. 2006;110(12):950–960. Chow DR. Tips on improving your use of endoillumination. Retina Physician. 2011:8(4):43–46. Charles S. Curved scissors delamination. Retina Today. 2012;Jan/Feb:52–54. Kamura Y, Sato Y, Deguchi Y, Yagi F. Iatrogenic retinal breaks during 20-gauge vitrectomy for proliferative diabetic retinopathy. Clin Ophthalmol. 2013;7:29–33. Lei Shi, Yi-Fei H. Postvitrectomy diabetic vitreous hemorrhage in proliferative diabetic retinopathy. J Res Med Sci. 2012;17(9):865–871. From Mansoura Ophthalmic Center, Faculty of Medicine, Mansoura University, Mansoura, Egypt. Address correspondence to Sherein Hagras, MD, Ophthalmic Center, Department of Ophthalmology, Faculty of Medicine, Mansoura University,Al-Gomohoria Street, Mansoura, Egypt 35516; email: shereinhagras@gmail.com.